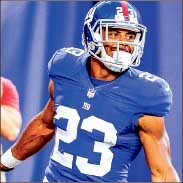 The world knows him as Rashad Jennings — the starting running back for the New York Giants. But those who truly know him call him ’Shad — the inquisitive free thinker who one day hopes to be a marriage counselor and a philosopher. Jennings has built a reputation on the Giants as a veteran who knows what it takes to not just make it to the NFL, but to last. According to the NFL Players Association, the average NFL career lasts just 3.3 years, and typically that number shrinks for a running back. Jennings, in his seventh year in the NFL, makes big plays not just at the running back position, but also on special teams and as a receiver. He attributes his ability to contribute in so many ways to his entire lifestyle. Every little thing he does allows him to thrive — from his eating regimen, to his workouts, to the hyperbaric chamber he sleeps in. “All those things enable me to perform at optimal levels,” Jennings said. Jennings grew up in the Lynchburg, Virginia area and went to high school at Jefferson Forest before transferring to Liberty Christian Academy. During his time at Jefferson Forest, he was tasked to write a research paper on his hero. Jennings chose Dr. Martin Luther King Jr., but was unable to find a source that said what he truly thought of the important historical figure. In the end he quoted himself and sourced “Rashad Jennings’ mind.” His teacher gave him a failing grade and told him that he was not a credible source. Fast forward to Jennings’ time with the Jacksonville Jaguars. Jennings was asked to come to a classroom and speak to students who were writing papers on professional athletes. The students used Jennings as a source, and were given an “A.” Jennings took a copy of the paper back to his high school where he at one point had a .6 GPA so many years earlier. Years before Jennings made such an impact on the Giants, he was a young transfer at Liberty University. When Jennings came to Liberty from the University of Pittsburgh, the Flames were coming off a 1-10 season in which their only win came against a Division II school. In Jennings’ first semester as a Flame, he was selected as team captain according to libertyflames.com. In Jennings’ junior and senior years, the Flames went undefeated in Big South play earning the Flames their only outright Big South conference championships in program history. Jennings finished his career at Liberty with records for most consecutive 100-yard games (10), most career 100-yard games (22), most rushing yards in a season (1500), most rushing touchdowns in a season (17), most career rushing touchdowns (42), most points in a season(114) and multiple other records, according to libertyflames.com. “I look forward to the day they retire my jersey and put my name up there in the stadium,” Jennings said. SCHMIEG is the asst. sports editor.